Hello my name is Mariah Nigl, I am nineteen years old and I am the daughter of Mike and Mary Jo Nigl. During my spare time I enjoy dancing, shopping, and just about anything else a teenage girl loves to do. I am currently attending UW-Richland and my future plans include criminal justice and forensic science at UW-Milwaukee. After high school I decided to stay two more years at UW-Richland to be with my family.This also was a great opportunity to be a part of the community and get more involved before I left and that is why I chose to run for Fairest of the Fair. The fair has always been a huge part of my life living here in Richland County. And I am so honored to inform others of everything the fair has to offer! 2011 graduate of River Valley High School and after finishing my first year of college at the University of Wisconsin – Stout I am happy to be back in Richland County promoting something that I truly care about, the Richland County Fair! I have been involved with the fair since I was seven years old and it has been a huge part of my life. I have exhibited many projects throughout the years and made so many wonderful memories, the best of which include my family and friends. It was actually because of my family and friends that I decided to run for Fairest of the Fair. They showed me just how much this community means to me and how much of an honor it would be to serve as the Fairest of the Fair. I am so grateful for my friends and family that have supported me through everything and I know they will continue to support me as I move on to the University of Wisconsin – Milwaukee to study Veterinary Science, and someday I hope to be back caring for the animals of the people who once taught me how to care for mine. I am extremely excited for this summer! I look forward to meeting so many new people and getting an inside look “behind the gates” of the fair. The great people that keep the fair running smoothly do not get enough credit for all that they do and I would like to thank them. Don’t forget to visit the Richland County Fair September 5th through the 9th. You won’t want to miss it! Hello, I am Marin Lynch, Richland County’s Future Fairest of the Fair. I am daughter of Michelle and Eric Hendricks and Scott and Stacy Lynch. I go to Richland Center High School and actively participate in band and choir activities. Outside of school I read, listen to music and talk with friends. 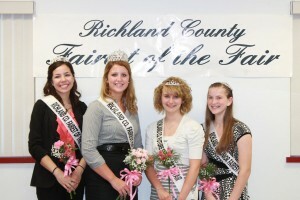 I wanted to be Richland County’s Future Fairest of the Fair because I thought it would be a great learning experience. I have already learned so much about the community. Helping to promote the Richland County Fair is a lot more fun than I thought it would be. And who wouldn’t mind the tiara? The Richland County Fair will full with many interesting things. This year is the Fair’s 150th anniversary and there will a tent to visit. Snakes Alive will have a show for all the reptile lovers. Please don’t forget to come to the Catch A Pig contest on Wednesday and the Demolition Derby on Saturday in the grandstands! I’m Alexys Stibbe. This year’s Junior Fairest of the Fair. My parents are Kirk and Shelly Stibbe. I am a freshman at Richland Center High School and the treasurer of Buena Vista Wonder Workers 4-H Club. I enjoy working with dairy, sheep, photography, dance and scrapbooking. RC Dance and Gymnastics and the RC Purple Devils AAU Gymnastics have been a part of my life for a long time and I’ve been involved in the Community Players musicals. I’m looking forward to being in this year’s production of State Fair. 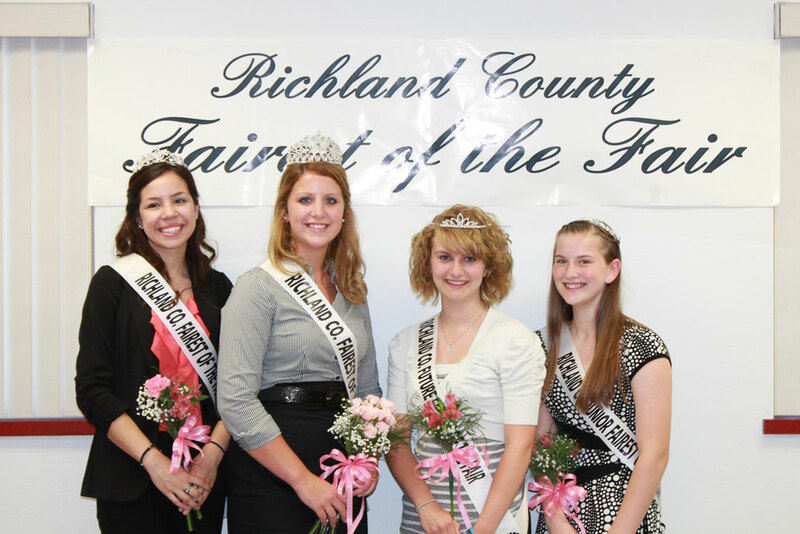 As Richland County’s 2012 Junior Fairest of the Fair, I am especially excited to celebrate the 150th anniversary of the Richland County Fair this year.